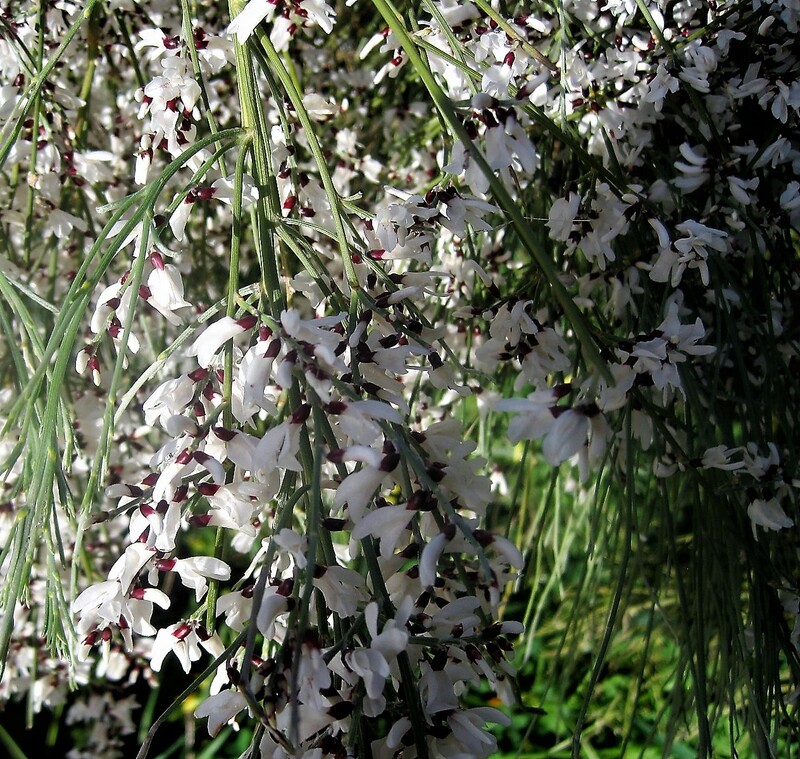 I can get a bit obsessive sometimes, so when it was suggested to me that the area around Punta del Moral, in Huelva province, has more than its share of beautiful, white bridal broom right now… well, nothing for it but another trip to Spain! By one of those strange quirks of fate, Todos a Caminhar were holding an event there this Sunday, which gave me just the excuse I needed. I’ve introduced you to Todos a Caminhar before. It’s an initiative to keep people healthy by getting them out walking. Each Sunday at 10 they meet at a different venue, and on this particular weekend it was a coordinated effort with the council in Ayamonte, across the Guadiana in Spain. Coachloads converged on Punta del Moral from around the Algarve, and the locals came too. There are always a few characters at these things, and the gentleman with the strange horn amused himself, and the crowd, with a spinning top and a hoop. There was a great feeling of camaraderie, free drinks and even a small cake- don’t tell! People lined up in semi-organised fashion after a bit of a warm up and, with a minimum of jostling, we were away. Soon the crowd thinned out as people found their own walking pace. There were 3 different walk lengths, from 4.7 to 10.5km, to cater for all abilities. It’s a very watery world, out there on the salt flats. A lazy amalgam of river and sea. Much of the heather looks like scrub with the tide out, especially at this time of year. In summer it glows a beautiful lilac, but it’s too hot then to walk in this open terrain. The river wanders wilfully, twisting and turning, often sluggish as the tide nudges in and, just occasionally, gushing and frothing with enthusiasm. 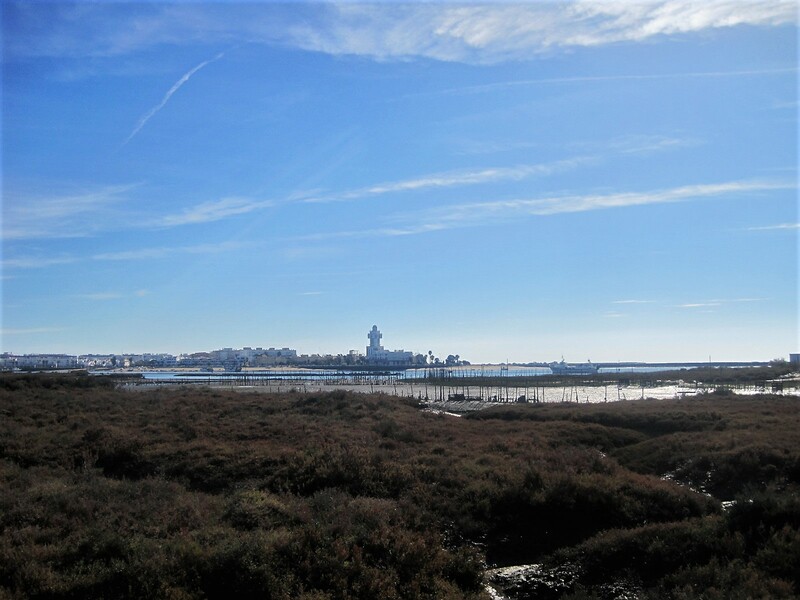 Our path takes us close to Ayamonte, clearly visible across the channel, and then turns its back to head for the ocean. 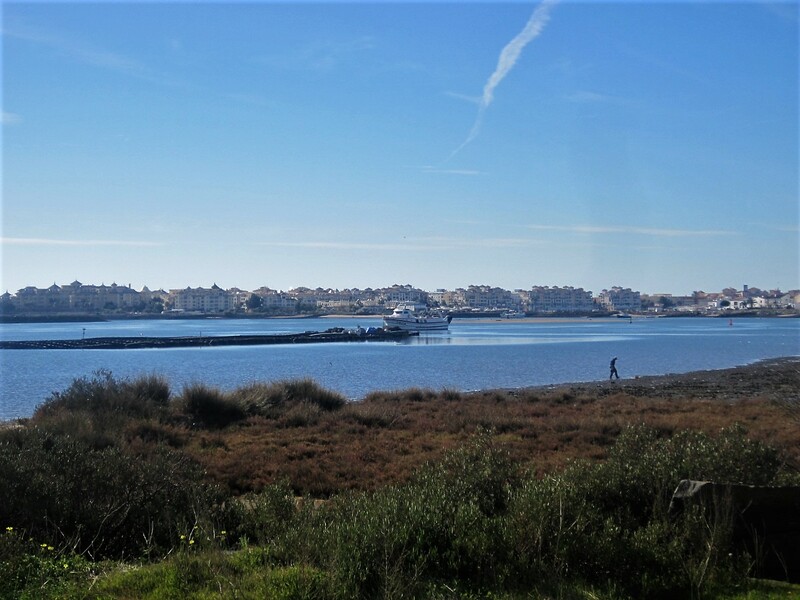 A lone fisherman searches for shellfish to eke out the diet while, beyond him, the fancy resort of Isla Canela fills the horizon with empty apartments. In the opposite direction, the lighthouse at Isla Cristina commands attention, blinking in bright sunlight. Around we go again, pausing only to glug a little water, and admire a cluster of cistus, who seem to be a long way from home. The broom are not so prevalent here, but thronged the road in welcome as we approached, and are there to nod goodbye. 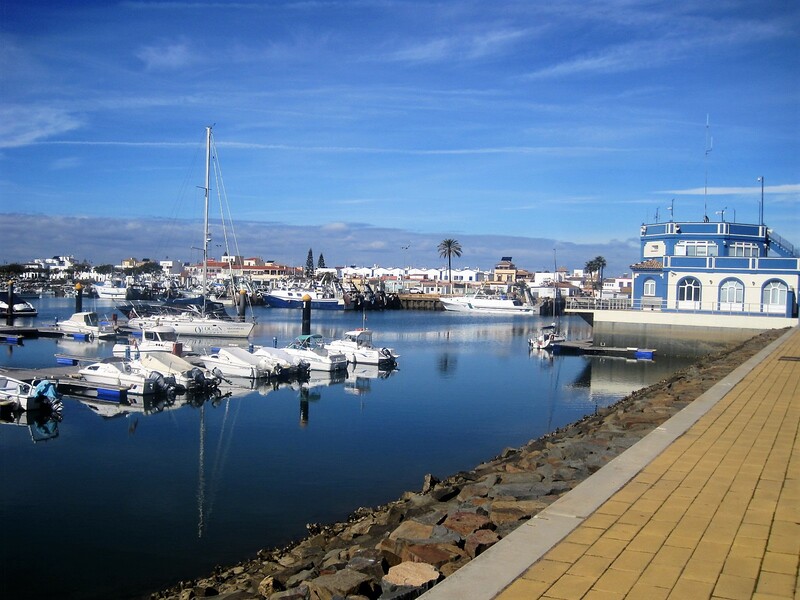 Before we left I persuaded the other half to take a final look at Isla Canela. We once considered buying there, but are very glad we didn’t. For a boat lover like me, the marina is a magnet, but there’s no heart to the place. I’m consoled by a single, shocking pink Livingstone daisy- old friends of mine. And, on the very edge of the resort, stop briefly by Ermita de Nuestra Senhora de Carmen. I’d narrowly missed opening time- 11.30-1.30 on Sundays, but if I’m ever around on 16th July, I might get to see Our Lady carried to the estuary. After all that walking, you wouldn’t begrudge a little something sweet, would you? And packed full of healthy fruit! Spoilt for choice again this week! There’s a bumper bundle of walks- please do visit as many as you can. And feel free to join me here on Jo’s Monday walk with one of your own. I’ll try and make you welcome. Debs didn’t have enough energy to haul us right up the hill. I would never suggest she should eat more cake! Monday walk…This yard looks sharp! Not an easy one to spell, but this looks like a beautiful place, Natalie! I seem to be traveling backwards with Carol! I normally expect Karen to take me walking in Australia, but this one fooled me! Gunta takes us down among the Redwoods- a stunning sequence! Glad to see things are improving down Lisa’s way! While Sandra had me peering out of the window in delight! I love the rugged tree roots in this one! Come and paddle with Amanda! And Cathy is sharing more of her Camino experience. Another one not to miss, but do beware of the bulls! That’s it for another week. Hope it’s a good one! Take care of yourselves, and I’ll see you next time. No Spain, but maybe chocolate?